"He was burned by the twentieth century. Now he's doing time"
Sorry, no matches on eBay for "So Long Marc Copland John Abercrombie". 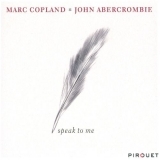 Sorry, no matches on iTunes for "So Long Marc Copland John Abercrombie".